As the weather begins to warm from the onset of spring, and with the summer fast approaching, you may be considering how you and your family can spend more time outdoors. Having a playful space nearby, such as a custom playset in your backyard, can make for safe, easily-accessible, and fun addition to your home. It can be a great place for your children and young relatives to play during family gatherings, as well as a way to ensure they stay healthy by being active outside for as long as possible. When it comes to deciding on what kind of playset you would want built, every family and property is different. For example, if you have a small-sized family and limited free space on your property, then you may want to build a small playset that’s proportionate to the amount of space you have, as well as the number of children who will be playing on it at once. The contractors you hire will keep this and many other aspects in mind, including the materials that make up your playset and its components, such as bridges, swings, slides, and climbing walls. At Groff Landscape Design, we are ready to prepare and install all kinds of custom playsets according to you and your family’s preferences. The overall process of designing and installing any sort of addition to your property can be pretty pricey, especially if you don’t have the proper tools, equipment, and materials in place. When you hire a professional landscape design service like Groff Landscape Design, those extra costs are all condensed into just the labor and materials of the service. Also, the entire process of construction is simplified down to simply relaying your design choices to us, leaving you and your family satisfied and stress-free. Playsets, or playgrounds, are regularly found in public schools and parks. This is due to the fact that they encourage a habit of staying active while playing outdoors, which is extremely beneficial to a child’s growth and development. It also promotes spending less time indoors, which helps curb the growing issue of persistent electronic and online media usage. A well-constructed playset can ensure that your children enjoy a safe and fun day playing outside. The truth is that not only do we build a playset for the purpose of improving our property’s appearance and making it more valuable to potential buyers. We do it for the chance to make memories with our children and loved ones. 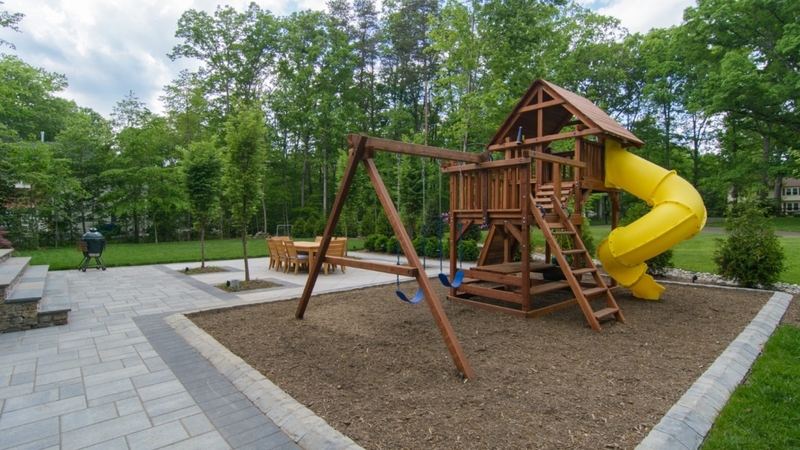 A playset embellishes your backyard in such a way that attracts them outdoors away from all the screens and into the fresh Virginian air. This way, everyone can spend the warm season outside together. A playset is more of an investment for your family than your property. Yet, with the right landscape design company assisting you in its construction, it can be an attractive addition to your guests and family, as well as potential buyers in the future. At Groff Landscape Design, we not only help create amazingly well-built playsets, but also several other installations such as patios, walkways, retaining walls, and many other form of landscaping available. Get started on your designing a playset in your yard today! Contact us today at 703-999-8225 for more information and a free quote.